Will “Low Sugar” Overtake “Low Fat” in Popularity as a New Year's Resolution This Year? The scientific report guiding the US dietary guidelines: is it scientific? We read with interest the paper by Teicholz on the scientific report guiding US dietary guidelines and the ensuing online discussion regarding the relative risks and benefits of dietary fat and carbohydrates.1 Ultimately, however, dietary decisions are made by consumers, not scientists. Consumers’ perceptions of the nutritional value of various food types are probably not only shaped by scientific discussions in the BMJ, but also by numerous other influences. These perceptions are difficult to measure, but the number of views received by a recent YouTube video2 and a newspaper article3 about the perils of sugar and the broad public support for the introduction of a “sugar tax”, proposed by a well-known British naked chef4 suggest that views of the nutritional value of sugar are indeed changing. To quantify public attitudes towards dietary fat and sugar, we used a public web facility, "Google Trends" (http://www.google.com/trends), to compare how often the phrases "low fat" and "low sugar" were entered in the world’s most popular internet search engine in preceding years (Figure 1). The term "low fat" shows a distinctive saw-tooth pattern: interest in this phrase is markedly attenuated during the holiday season, followed by a sharp rise in the number of searches at the beginning of each year. The search phrases "diet", “weight loss”, "healthy food" and "quit smoking" show a similar pattern (data not shown), suggesting that these searches are indeed a reflection of a common desire to modify unhealthy behavior at the start of the new year. 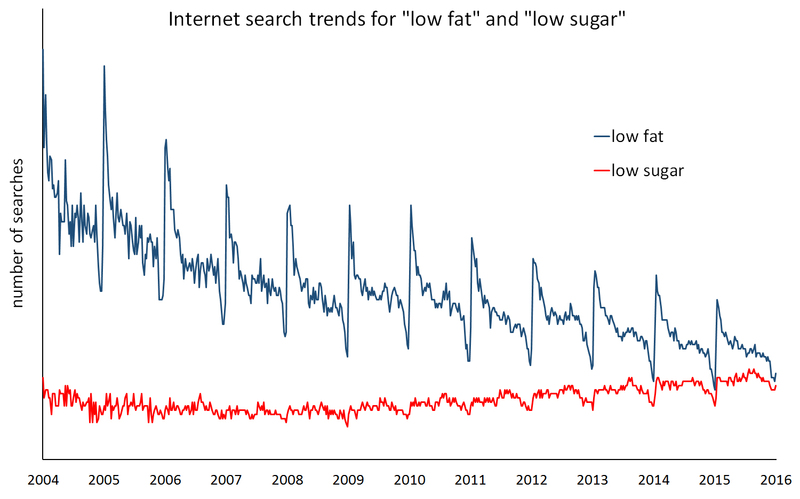 Interestingly, the popularity of the search phrase "low fat" has declined gradually since at least 2004, the earliest year for which data are available. In contrast, searches for "low sugar" have become increasingly common and the phrase will probably overtake "low fat" in popularity this year (Figure 1). A potential pitfall of this analysis is that a search phrase may have multiple meanings. For instance, the words "low sugar" may also have been entered by people worried about low blood glucose levels. However, Figure 1 shows that in recent years, the curve for "low sugar" has started to show a typical saw-tooth pattern similar to “low fat”, suggesting that the phrase is increasingly entered by people seeking to change their dietary habits as part of their new year’s resolutions rather than those with concerns about hypoglycemia.